CPR & First Aid Training! ​ 3 locations in Brisbane. ​​& On-Site Training for your business, group or club. Would you know how to help a family member ,a colleague, the child next door or your brother, sister, mother ,father, wife, husband, a stranger in that moment of need ? If not that very second you will wish you had completed a first aid course and gained the skills and confidence to act quickly and effectively! If it's a minor or major accident or illness your assistance may mean the difference between life and death! B-the one trained & B-Ready! 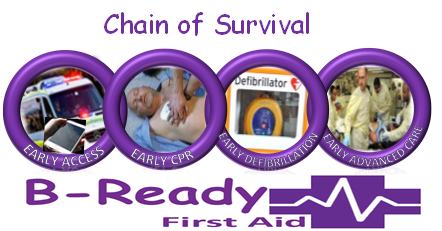 Training CPR, First Aid, First Aid for Education and Care Environments & LV Rescue in Brisbane and surrounding area's. This is a great app to have on your mobile phone.! EMERGENCY + pinpoints your location & shows your GPS coordinates so they can find you more easily when you call Triple Zero (000) another way to B-Ready! Student Handbook for your perusal, no need to print it out! USI :- Unique Student Identifier information! If you are undertaking nationally recognised training delivered by a registered training organisation you will need to have a Unique Student Identifier (USI). This includes studying at TAFE or with a private training organisation, completing an apprenticeship or skill set, certificate or diploma course. A USI gives you access to your online USI account which is made up of ten numbers and letters. It will look something like this: 3AW88YH9U5. In time, your USI account will contain all your nationally recognised training records and results from 1 January 2015 onwards. Below is also a fact sheet for Students to view.